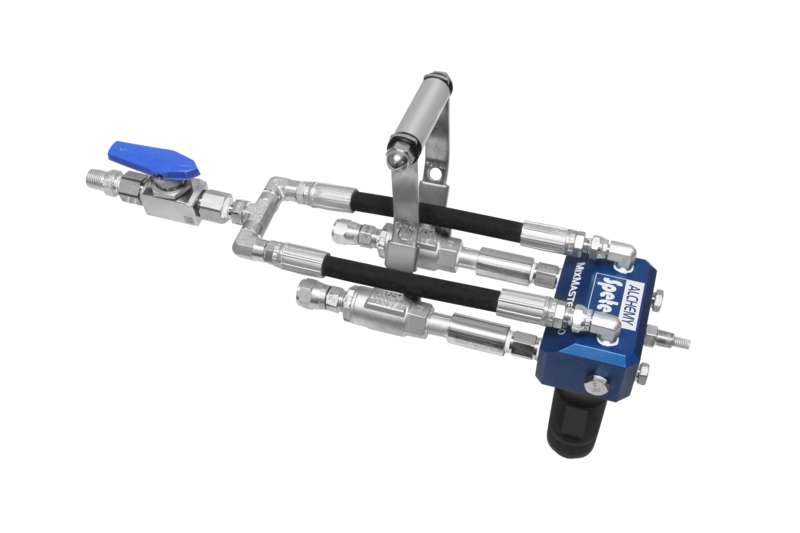 Two-component resin injection gun manufactured specifically for lifting concrete slabs, designed to handle back-pressure. As the essential piece of foam jacking equipment for Alchemy-Spetec’s expanding polyurethane foams, the resin injection gun provides highly-efficient concrete leveling. The attachment allows the user to stand while operating the gun. The Alchemy-Spetec PolyBadger lifting system is tough and compact. This system is an affordable entry-level option for new contractors, as well as an extremely portable addition to the experienced contractor’s arsenal. The PolyBadger is a lot less expensive than your standard 20 foot trailer rig. The set up is simple and requires minimal equipment. The entire system can easily fit in the back of a pickup truck!. The genius of the PolyBadger is the auto calibrator. It keeps the flow of A and B on ratio, eliminating the possibility of a crossover in the gun or the whip hose. The PolyBadger lifting system is offered exclusively by Alchemy-Spetec for lifting and leveling concrete slabs. As the essential piece of concrete leveling equipment, PMC plural component hydraulic proportioners are used to inject AP two-component structural polyurethane foams for Slab Lifting, Filling Voids and Soil Stabilization. Rugged and dependable, this concrete level equipment utilizes relays and circuit breakers instead of circuit boards, vastly increasing reliability and preventing maintenance problems. The MixMaster Slab Lifting Gun is manufactured by Alchemy-Spetec specifically for lifting and leveling concrete slabs. Note: The PH-40 Series is also available in 380 Voltage. Call for specs. Note: The PH-25 Series is also available in 380 Voltage. Call for specs. Note: The PH-2 is air driven with horizontal piston pumps. It is an excellent economical choice for low output jobs. Alchemy-Spetec is a proud distributor of Polyurethane Machinery Corporation equipment. If you would like more information on PMC systems and accessories before purchasing, please call us at 404-618-0438 or visit their website at www.polymac-usa.com.